County Clare during his visit to Ireland last February. Pat Hayes, Mayor of Clare is with him. Last week's announcement that the next year's G8 summit will be in Northern Ireland set heart afluttering south of the border. 'Do you think ... Could he ... Would he?' A little shutter of excitement at the thought that maybe, just maybe President Obama will come amongst us again. Memories of his triumphant 12-hour 2011 'homecoming' visit are still fresh, but oh, how the Irish people would love to have even fresher memories. Now, thanks to the G8 summit, there is real hope. Forgive me if I'm a tad cynical about the Irish hero-worship of President Obama, but his role in Irish affairs thus far has consisted of (a) having a pint of Guinness in a town he'd never heard of celebrating roots he never knew he had and (b) denigrating Ireland as a tax haven. I regularly hear that "Obama loves the Irish." Hmm. I'm sure he loves being loved by the Irish, but that's not quite the same thing. If you tell me that President Clinton loves the Irish I'd probably buy that. But President Obama? I don't think so. If we want to prostrate ourselves before a foreign leader it would be far better to do so in the full knowledge that we're doing so cynically in the hope that we will get something out of it. That would be preferable to having grown men and women slobber adoringly over a man who is, after all, a politician while seeking nothing in return other than that he accept our adulation. So if we're going to restrict ourselves to only cynical and hypocritical boot-licking then the question is: Who to woo? Angela Merkel is the obvious choice since she holds our future in her hands, but something tells me false fawning will get us nowhere with her. Vladimir Putin? That would require too much debasement on our part. We have to be able to draw the line somewhere. Prime Minister Harper of Canada would be an intriguing choice because so many Irish people are heading to Canada these days, but we should be able to find plenty of common ground with him without being untrue to ourselves. No, for me there is only one choice: China's new leader Xi Jinping. We should set our sights on Xi because China is an increasingly powerful player in the global economy, China's government plays a big role in the country's economy and because we have already made a good start with him. 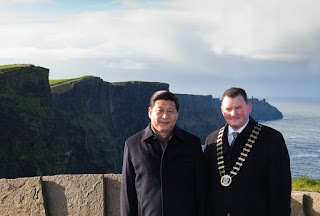 Xi spent a few days in Ireland back in February and by all accounts the visit was a success (aren't they all?). Skepticism aside, the Wall Street Journal's recent long profile article about Xi was accompanied by only one photograph of him: a picture of Xi kicking a Gaelic football at Croke Park in Dublin. The picture emphasized Xi's political skills, but also the success of the Irish in entertaining the future leader of the world's largest nation. At the time of his visit Xi was only in line to be China's next leader, but now it has been confirmed that Xi will be at the top of the Chinese government for the next ten years. He was important then; he's more important now. During Xi's time in Ireland the NY Times commented on the fact that Ireland's transformation from a poor, agricultural nation into a rich, high-tech one "fascinates Chinese officials." Xi too, apparently, as he spliced in technology and education deals with the Irish government when he wasn't charming the Irish and being charmed by them. Those few days in February may well turn out to be the most important visit by any current foreign leader, including President Barack Obama's. Xi's visit to Ireland was longer, lower key and much more substantive. Next year Xi will be in Northern Ireland for the G8 summit. It would be a real coup to lure him south for more "getting to know you" time. 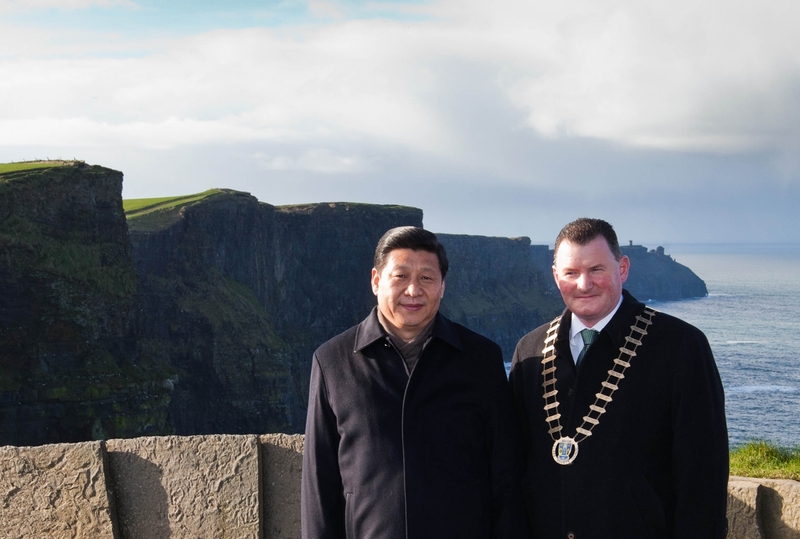 More pictures of Xi in romantic Irish settings will do no harm for the exploding Chinese tourist trade. Barack Obama may have hold of Irish heartstrings and Angela Merkel Irish purse strings, but Xi controls both Chinese heartstrings and purse strings and that makes him the most attractive candidate for Irish pandering. Let's get to it.